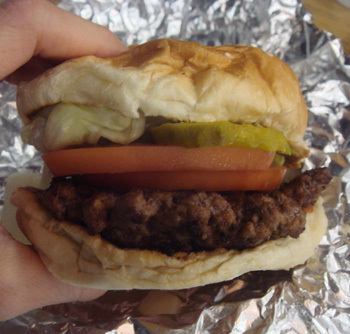 Last week we went to Five Guys, located at the “food mall”, at 301 Cochituate Rd. 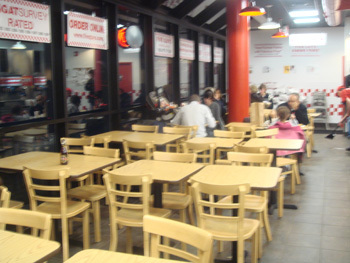 Inside was bright and busy with plenty of staff in the open kitchen grilling, assembling, frying and calling out orders. They have a pretty smooth system, you can even order online and have your food waiting for you when you get there. The menu focuses on burgers and fries but they do also offer hot dogs, which they butterfly to cook (I’m guessing to cook faster). All toppings are free and there are a lot to pick from. I got a “little burger” which is plenty, with lettuce, tomato, pickles and onions. Ethan got a little cheese burger with bacon. I don’t know how much bigger a “regular” size burger is but these littles are plenty. Fries come in two sizes: regular and large. We got a regular to share and it was more than enough. They generously overfill the serving cup, which leaves another two servings (or more?) in the bag. The burgers were good but as I mentioned in a previous post, the really shine with their fries. The only thing I’m not cray about is the store set up. Although it’s bright and clean, it’s loud and the seating can make you feel trapped if it’s busy. We lucked out and went on a slow night but the tables are so close together, if you sit by the window and people are in all the chairs around you, good luck getting out. Ya I was scared by the seating in there. We havent been in there but even Natick is jam packed & that has more seating. The regular burgers have 2 patties, its way too much food! When we first started going to Marl or Foxboro. We would get regular burgers & a large fry to split. UGH! I love this site! Will you be doing a review re: Angry Ham Garage? I went there the other night..huge portions and they also pour their drinks fairly heavy and are reasonably priced. Was wondering what you thought of it. My husband keeps telling me we have to try it – thanks for the info about the portions! RP, Yeah I want ot check out Angry Ham’s but I can only go as my budget allows. Going out twice in one week was a big deal for me! I will get there eventually though. 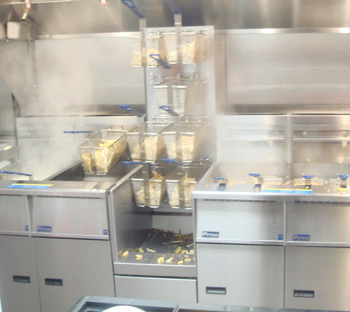 I just can’t get past the fact that you can only get your burgers cooked “well done” — blech! I love rare steak but draw the line on hamburg. No reason to go back. We ate at the bar once at the ‘Hams. Went once for drinks. Has burgers and some apps. not that great. but what did we miss??!! the PIZZA !!!! Awesome thin crust pizza. large size is HUGE. very very good. that bartenders were fine in my opinion. nice eye candy. good mixed crowd of younger and middle aged folks. the large burger is just a double. two patties instead of the one. If I want to die of a heart attack at a young age, I’d Five Guys every day up until that point, if I could afford such a diet. Been to Angry Ham’s twice during games. Great atmosphere, excellent wings and rings, esp. for the price. Could use a more interesting beer selection — lots of taps but mostly Bud/Miller/Coors/Sam Adams varieties. But a very fun place. I hope it stays around. 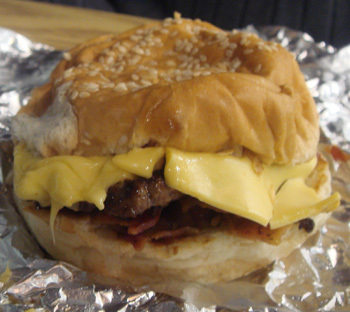 I ate at a Five Guys in NJ once — good burgers — best fast food burger I’ve had other than In n’ Out in Calif. But it would be nice if they had some healthier or lower-carb options (whole wheat buns, sweet potato fries, etc.). 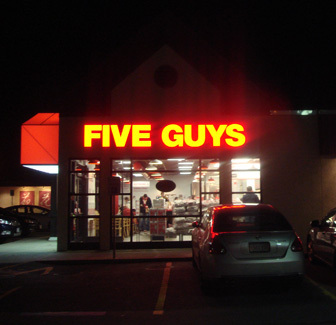 I go to the 5 Guys in Dedham once in a while. It’s pretty good as far as fast food burgers go. I remember the good old days of this mall when Newbury Comics was there (selling more comics than music) and Child World. Does this mall even still have an interior? 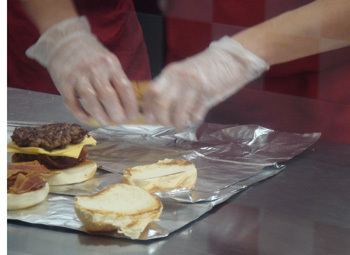 Five Guys is good for a fast food joint, and very good fries, but the meat is just ordinary and more often than not torn while being flipped. If you’re going to pay twice the going rate of McDonald’s, better to have a burger that’s twice as good, and Five Guys isn’t twice as good. If you order a burger you automatically get a double unless you say you want a small, a bouble is very filling. 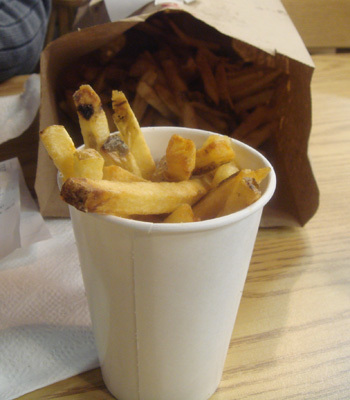 A regular order of fries is good for 2-3 people, their gimmick is to fill the cup put it in the bag and then throw in an extra scoop. The fries are usually piping hot and delicious. I’v been to three diffrent locations and they all play the music very loudly and the cashier’s are encouraged to shout out the orders to the cooks (not a quiet place to enjoy your burger) The hot dogs are split down the middle, not bad but mine was a mess with the condiments all over the bun. A little pricey, be prepaired to wait for your order.